For Volunteer or Sponsorship Opportunities, Contact us at 708-279-0519 or Send a Message on our facebook page! MAP of HOPE Foundation was founded in 2013 by a group of other philanthropic Women who have all been touched one way or another with life-threatening illnesses. They have all come together to form this foundation, with the mission of bringing HOPE to others, through spreading AWARENESS and putting a spotlight on WORTHWHILE CAUSES and CHARITIES by organizing events for their benefit. © 2016 Map of Hope Foundation. Some rights reserved. 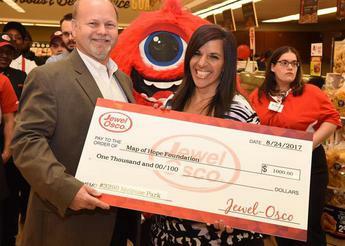 Celebrating the re-grand opening of Jewel-Osco today in Melrose Park. Thank you so much for your generosity and commitment to our community and to local charities. We at MAP of Hope Foundation are truly grateful for your support!